Despite being the smallest state in Myanmar, Kayah is mighty in size when it comes to diversity and amazing travel experience. Closed from visitors for nearly 50 years, the state’s reopening has allowed it to flourish as a hidden gem of Myanmar that shines with authenticity. Kayah is home to nine different ethnic groups, giving ample opportunities for tourists to discover the cultures and heritages. The most distinctive tribes are Kayah and Kayan. The Kayah people are known to dress in bright and red-coloured attire while the Kayans are easily recognized from the brass rings they wear on their neck. The humble town provides warm local hospitality and memorable hands-on experiences with the tribes through the Community-Based Tourism initiatives. Locals are more than happy to share their expertise and knowledge in various skills with tourists. 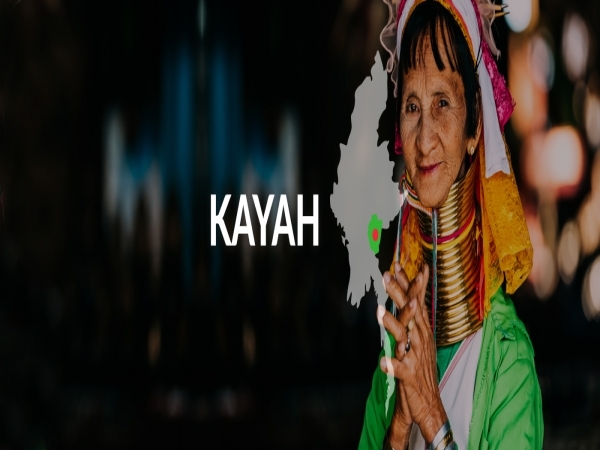 Origin: Kayah has different types of tribes like Kayah, Kayan, Bre, Lahta, and Yinbaw. The people in the state practise Buddhism, Christianity and animism. The Kayah people speak Kayah Li, Myanmar/Burmese and limited English. Geography: Kayah has a mountainous landscape and is located on the east side of Myanmar. The borders of this state are Shan State, Kayin State and Thailand. The state size is 11,731.5 sq km/4,529.6 sq mi. The highlands are generally wet and mildly hot whereas the lower areas have tropical and monsoon climates. Interesting Facts: Kayah people are animists and believe in spirits. There is a hydroelectric production dam in Kayah called ‘Lawpita Dam’. Women in the Kayah group (Red Karen) still wear brass rings around their neck. Handicrafts play a huge role in the domestic, artistic and spiritual life of the Kayah people. The locals craft bamboos and woods into fully-functional musical instruments and are highly skilled with each of their crafts. They are most famous for making the “kaloe” or bamboo guitars. Bamboo baskets and purses produced by the villagers are usually bought as souvenirs. The locals are also known to be excellent weavers. Their fabrics are coloured with natural dyes and weaved on a loom, producing vivid-coloured scarves that are perfect as souvenirs. Frog drums are considered to be auspicious and sacred to all the villagers. The bronze, mushroom-shaped instrument is made of bronze and is only played during special occasions. Bamboos and woods are also made into cooking utensils and household items and the villagers also make jewellery out of brass and synthetic stones. These show how well the villagers could sustain on their own due to their expertise in crafting useful items. The diverse ethnic groups found in Kayah State are actually branched out from Karen culture and the largest tribal groups are the Kayah, Kayan, Bre, Lahta and Yinbaw. Authentic traditions and customs are earnestly passed down for generations. As a result, most of the tribe people still dress in traditional clothes, most notably the Kayah and Kayan tribes. Both ethnic groups are easily identified as the Kayahs always dress in red while the Kayan people still wear brass neck rings. The Kayan tribe is widely acknowledged as the most recognisable ethnic group in South-east Asia due to their elongated necks as a result of wearing the neck rings. The Kayah people were once devout animists who engage in the ‘Kayhtoboe’ ritual. In this ritual, tribe members pay respects to spirits by offering animals and food in exchange for protection. However, the tribe’s animism culture has ceased over the years and is no longer widely practised. Tourists get to experience the warm hospitality of the locals while witnessing their passion in showcasing the state’s rituals, crafts, and music. As some of the locals practise animism (a belief that all natural things have spirits), tourists get to visit animist temples and visit sacred totems that could be found there. They can also witness how shamans hunt, experience shooting a catapult, and taste delicacies found in the state. Tourists can engage in activities that revolve around the heritage beliefs of the locals regarding legendary forest skills. Locals guide visitors to trek forests on natural trails, have jungle picnics and participate in barbeque meals by the lakes, just like the natives. These set of activities enable the locals to continue with their native practices, as well as allowing tourists to experience the authentic lifestyles of the locals. Loikaw The Shan people named the capital city of Kayah as Loikaw (‘loi’/mountain and ‘kaw’/separate) which represents the middle point between Shwe Taung and Thiri Mingalar Taung mountains. Loikaw is famous for Taung Kwe Pagoda, a site that offers a picturesque view of the capital city’s landscape. Tourists also come to Loikaw to visit museums, churches and browse traditional craft in busy markets. Taung Kwe Pagoda The iconic site of Loikaw is located on top of Thirri Mingala Hill as an area that houses a cluster of pagodas. Situated atop a hill at 387 feet high, tourists are gifted with a panoramic view that stretches across urban areas and hilly landscape. Also called the ‘Broken Mountain’, various pagodas can be found on multiple layers of broken mounds. Pan Pet Village The Kayan people and long-neck women reside in Pan Pet. Women in the village began wearing brass rings on their neck since they were young, resulting in having long necks. Some women even wear brass rings on their legs that would become loose as they grow older. The removed leg rings are then turned into bracelets to be sold as part of the community-based tourism project. Hta Nee La Leh VillageIn this village, tourists get to witness how locals make the Kayah dress traditionally as well as the making of traditional musical instruments. Hta Nee La Leh has traditional Kayah totem poles and a village hall that the local shaman uses to make predictions and tell fortunes to the villagers. Women in this village don silver and aluminium accessories and lacquer rings below their knees. Seven Stages Lake On the way to the lake, tourists can enjoy the exotic beauty of Loikaw’s countryside. The lake is made up of 7 other lakes with small channels that connect them together. Situated by the hills, the scenery reflected on the lake gives off a soothing and peaceful feeling to tourists who visit the area. The lake is accessible by car and bus. Kyat Gu or the Cave of Spirits offers an otherworldly experience for tourists who want to explore the mysterious cave. It is undisturbed and quiet. There are broken wooden boxes in the limestone cave that are believed to be coffins placed by the tribes in the cave a long time ago. Locals also collect bat feces from the cave to be used as fertilizer. De Maw Soe Market can be found at the south of Loikaw. The market is famous to sell traditional rice wine. The vendors are friendly and kind, and they usually invite tourists to taste the much-loved beverage and other local delicacies that couldn’t be found outside the state or country, like Kayah sausage and meatballs that are made with the unique Kayah pepper. Weaving CentreTours around the weaving centre and organic gardens are available for visitors who want to explore traditional weaving and natural dyeing processes. An expert and trainer from the centre will present interesting details about the art of weaving including showing the production of natural colours. Tourists can dye the fabric, witness different ways of weaving the Kayah longyi and browse some woven products as souvenirs. Aung Thapyay Cave The cave that houses 10 sitting Buddha statues can be found near Htee Se Kha Waterfall. The magnificent stalactites and stalagmites decorating the interior of the cave coupled with Buddha statues make up an amazing tourist destination. Macaque monkeys can also be seen near the area. Besides visiting the cave, tourists can visit the village nearby and experience the lifestyle of the locals. Lwel Ta Mu Cave There is an interesting story behind the discovery of the cave. Based on a legend, a local found the cave based on what he saw in his dream. Ever since its discovery, 15 pagodas are built and 254 statues could be found in the sacred cave. The purpose of the pagodas is to bring good health and wealth to the locals. Kayah State Day: The festival serves to remember the struggles of Kayah leaders who went up against the British Imperialists. Held at the beginning of the year annually for 10 days, locals would gather at Kandarawady, Loikaw to participate in traditional dancing contests, stage performances, beauty contests, marathons, sports matches, and other entertaining activities. Thadingyut Light Festival: The second most popular celebration in Myanmar involves the locals placing lights and lighting up candles all over buildings, houses and streets to represent the precious stairways taken by the Buddha during his descent from heaven. Tourists can walk on the brightly lit streets or enjoy watching zat pwes or traditional Myanmar musical plays. Thingyan Festival: Held in April, the biggest festival in Myanmar has attracted tourists to witness the celebration themselves. Families would gather for meals and to exchange blessings with each other. In this highly anticipated festival, locals cleanse their body and mind off evil and negativity of the past year by pouring water on one another.